Remember the mid-80s, when Kathleen Turner had fantastic legs, Michael Douglas’ blend of cockiness and sleaze was still charming and Danny DeVito was... relatively normal-sized? They made a fun adventure movie about a romance novelist who found herself inside real-life adventures as cheesy as her own novels. Then they made a not-so-fun sequel. 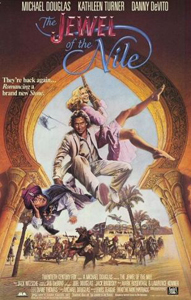 How Well Do You Know Romancing the Stone and Jewel of the Nile?